Come on in and join the party! It should be fun – for this is the party from hell. There are many reasons for the ghastly nature of this party, well-directed by Ian Forrest: Mike Leigh’s classic play is set in the late 70s when fashion and common sense seemed to commit suicide; the love-it-or-hate-it music which accompanies the Theatre by the Lake’s production (there’s only so much Demis Roussos one can take); most of all it is the gut-wrenching, cringe-worthy interactions between five people you wouldn’t want to spend five minutes in an elevator with let alone a party. Yet you can’t help but watch, albeit possibly between fingers with head in hands. Interestingly, we never do get to see ‘Abigail’s party’ despite the title. Abigail is shy divorcee Susan’s teenage daughter who’s having a house party with no mum allowed. So Susan (Cate Hamer) joins Laurence (Richard Earl) and Beverly’s (Polly Lister) party and meets Angela (Frances Marshall) and Tony (Jonny McPherson), a young couple recently moved into the street. The ensuing party, needless to say, is as disastrous as Abigail’s is noisy. Which is great for us because the awfulness makes for pure comedy and these actors time things to perfection. I already knew Richard Earl would be brilliant after seeing him in The 39 Steps, but particularly impressive for me was watching Polly Lister given the chance to shine as the loud and flirtatious Beverly around whom the party – and the play – revolve; she didn’t disappoint. Jonny McPherson, dapper and suave in The 39 Steps so completely transformed into the monosyllabic ex-footballer Tony (in the first half almost his entire lines consist of “yuh” and “ciao”) that I could scarcely believe it was the same person. Indeed, the guy seems to have grown at least a foot in this performance. Don’t ask me how; I have no idea. 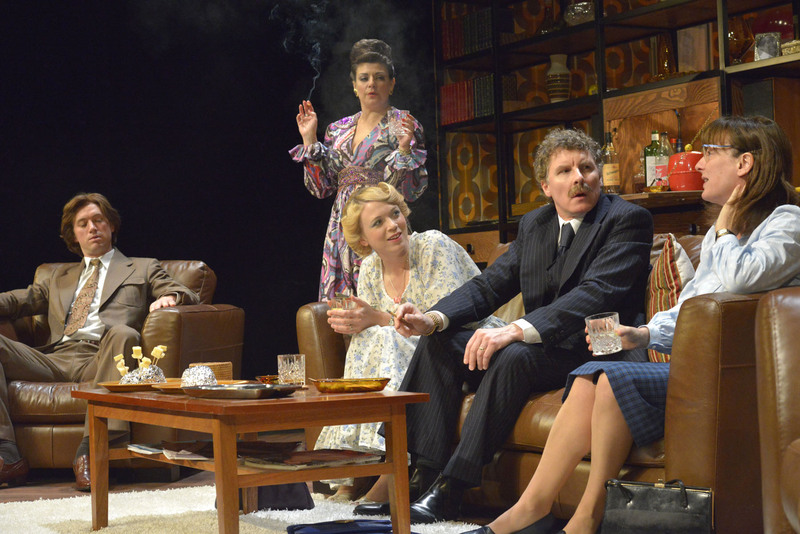 I should warn you that there is smoking on stage at times (integral to the play and totally in keeping with the 70s) so if you’re not keen on the odour or are irritated by smoke you might want to consider a seat further back or high up. 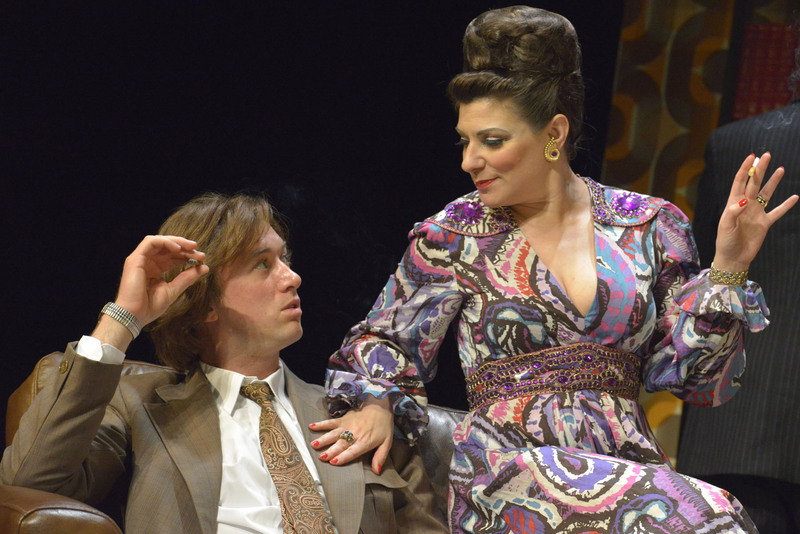 That aside, the play is well worth seeing especially if you’re old enough to remember the 70s – though you might then cringe for reasons other than what’s happening on the stage. I made the mistake of telling my wife, nostalgically, that I liked some of the furniture brilliantly assembled on the stage by Martin Johns. The horrified look she gave me was worse than any saved for the play itself.